When standing in front of the Lyon cathedral, you see a building on its right side. You immediately see that this is an ancient structure. The round Romanesque arches tells that it predates the era of the Gothic cathedral. It once was the house of the Church Singers and is today the oldest building in Lyons historic centre. 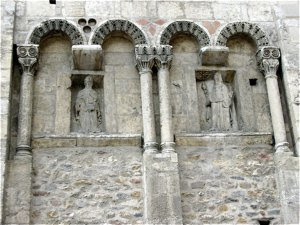 The Cathedral of Sain Jean was built from the 12th century into the 15th century. It is one of three churches on the site that date back as far as the 3rd century, and is actually located on one of the oldest christian sites in Western Europe outside Rome. To the left of the church you see a smaller stone building - the Manecanterie. 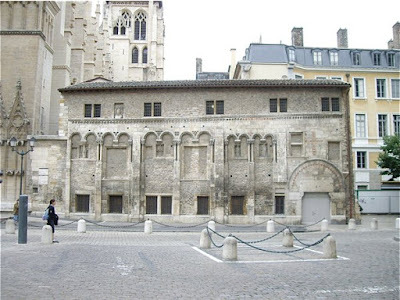 It is probably one of the oldest, if not he oldest historic building in Lyon. Whereas the Gothic church is a tribute to the Gothic style, with elegant pointed arches stretching towards the sky, the Manecanterie represents the style predating the Gothic, i.e. the Romanesque archictecture. Built on remains going back to the 2nd Century, parts of the present Manecanterie may go as far back as the 8th century. 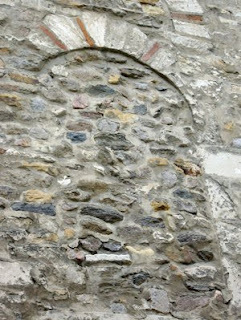 An arch in brick and stone on the south facade (left), may be the remains of a canonic residence built by bishop Leidrade that was bishop under Charlemagne. The name gives an indication of what the building was used for. The name comes from Mane; i.e. morning and Canterie, meaning singers. It was the home of the boys choir of the cathedral. Here they were taught musical skills as well as religious matters, and schools like these were important for those that wanted to enter a career in the church. The various subjects taught in medieval schools (philosophy, grammar, astronomy) are supposed to be represented in the alcoves under the twin arches. The Manecanterie is one of these buildings that touch you deeply as it has been scared by its long and turbulent history. 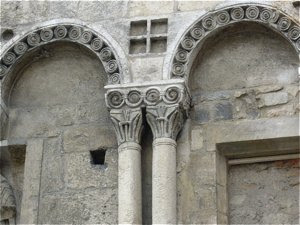 There are beautiful original windows flanked by archaic and primitive columns made more than 1000 years ago. Then there are mullioned windows that were added in the late 15th-early 16th century. In 1562 the war between huguenots and catholics led to the destruction of the cathedral as well as its adjoining buildings. The facade of the Manecanterie was severely damaged. In 1768 wings of the building were torn down to be replaced by newer addtions that were never completed. This long story leaves a building marked by the ages, with an age and character to it. It is like one of these ancient oak trees you see from time to time, marked by seasons and weather with turned and twisted branches. It is a place to see and meditate, as it makes us so very small and insignificant, but it is important to remember that even we leave our mark behind.